Cupar’s AM Soccer Club has spoken of the pride it has in its players after two were called up to play for the Fife Regional Squad. Ross Grant and Richie Lawson were both part of the Fife side which beat Stirling and District at Ochilview recently. AM Soccer has proven itself as a terrific breeding ground for young talent, with several moving on to places in the senior ranks. 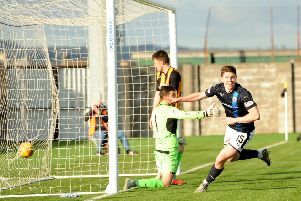 Kyle Bell, Keir Macaulay, Ben Davidson, Ross Hain and Lewis Crosbie are all at Raith Rovers as part of u20 squad. Blair Penman and Liam Woods are with Cowdenbeath while Ross Mutch is with East Fife. Louis Appere, Scott Reekie and Kieran Inglis are heavily involved in the Dundee United u20s. Craig Burt is full-time with Dunfermline while Dino Leddie signed full time at Hearts. Lindsay Sharp from AM Soccer said: “The club is proud to support all of it’s players whether that be for enjoyment at amateur level, or in a performance based environment where individuals wish to pursue football as a career.